Searching for a person lost in the bush involves gathering information (lost person data, witness reports, clues, weather forecasts, etc.) and then acquiring and applying appropriate resources (ground searchers, helicopters, dogs, etc.) to specific areas within the search boundaries. Trained search and rescue dogs with suitably equipped and experienced handlers can be a valuable supplement to other search resources. Effective deployment however requires an understanding of how search dogs work, their strengths and their limitations. All humans constantly emit microscopic particles bearing human scent. By the millions, these particles become airborne and can be carried by the wind for considerable distances. Airborne scent is concentrated near its source, follows the air currents, and becomes more dilute the further it travels. An air scenting SAR dog is especially trained to locate the scent of any human in a specific area and close in on the source of the scent, and can do so from hundreds of metres away, in heavy bush or in the dark. SAR dogs are not restricted to following the missing person's track and can search long after the track is obliterated, zeroing in on where the person is now, regardless of how they got there. Ideally, the callout should occur the moment it is suspected that a missing person may be in the bush, regardless of the hour of day or night. Dog teams can deploy quickly and independently of other search resources, and can be a highly effective first response. Most search dog teams welcome the opportunity to practice call-out procedures, and the reaction to a false alarm, or to being called to a search that is resolved before they arrive, will be one of relief rather than resentment. If in doubt as to the usefulness of dogs in a specific search, discuss the situation with the dog handlers who will freely provide an objective assessment. Search and rescue dogs and their handlers are adept at working at night and can be deployed while other resources are being marshalled or are regrouping. They are routinely deployed at night when time is critical (eg. missing child, known injury). POD for a dog is far higher in the evening and into the night because scent concentration is highest, especially if the air is still. Dogs see quite well in the dark and sounds carry better, increasing the chances of detection aurally by the dog or the handler. Air scenting search dogs can be used in almost any weather. Although strong winds, snow or heavy rain may destroy all traces or a subject’s track, the subject is still emitting scent, even if deceased. Wind helps rather than hinders the dog’s ability to detect scent. Light rain will rehydrate scent emitting particles that may have dried up during the day. in rural areas including farmland. in and around houses for children who may be hiding. for elderly persons who have wandered off. of snowfields, especially in whiteout conditions. for deliberately concealed bodies (3) where only a general location tip has been received. in heavy bush around lakeshores for incapacitated or deceased victims who may have swum or been washed ashore. from a boat over still water for bodies floating well below the surface. in urban areas, especially areas with crowds or heavy vehicle traffic. in steep terrain requiring frequent scrambling or climbing. While air-scenting dogs will discriminate between other searchers and the missing person (4) , they are trained to find “anyone” in the assigned search area, including members of ground search teams, family members trying to help and other hikers. It is therefore preferable, but by no means essential, to assign dog teams to areas thought to be empty except perhaps for the subject. While it helps if others have not been in a search area before the dogs, a dog team can be sent in once 15 minutes has elapsed from other search teams vacating the area, no matter how many people were previously there. If other searchers cannot be avoided, try at least to keep them downwind of the dogs. Dogs are far more effective when there is a breeze or moderate wind, and their handler will in general work them across or into the wind (5) . Dogs will generally sweep back and forth across the wind. In the morning and evening when there tend to be downdrafts, and at night when there are inversions and downhill air flows, they will typically work in valleys and uphill. In the middle of the day when there tends to be updrafts, they will tend to work on ridges and downhill. On still summer days, because convection takes the scent plume straight up, areas checked in the middle of the day should be rechecked in better conditions. While dogs can be used at any time of the day or night, they have a higher POD in the early morning and late afternoon - early evening. In the early morning, scent-generating particles that stopped decaying overnight will start emitting again when re-hydrated by the dew and warmed by rising temperature. Afternoon breezes will shear a vertically-rising scent plume and send the scent back along the ground. Scent emitting particles are most active in the late afternoon and early evening. Most search dog handlers are familiar with the principles of search management including lost person behaviours and all are aware of the intricacies of scent behaviour and how their dogs can be most effectively used. 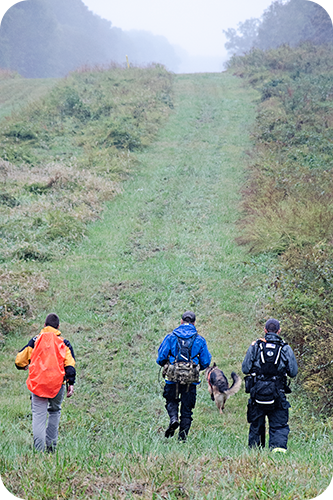 The effectiveness of dog teams will vary depending on terrain, weather and the time-of-day and guidance should be taken from the dog handler when assigning search areas. Other search resources can then be tasked around these areas. … in the first response stage of a search. Dogs are the best tool known for finding missing subjects. Especially when resources are limited and/or time is critical (such as missing children or known injury), it is more effective to deploy dogs (6) in areas of highest probability consistent with typical lost person behaviours (7) and deploy other search resources elsewhere. Providing this has not already been accomplished, the first response with a dog team will in most cases be a “hasty search” of all trails, logging roads, power lines etc., then around notable terrain features (eg. viewpoints, headlands, lake shores etc. ), and then all drainages in a 2.5km radius of Point Last Seen (PLS), all taking into account natural or man-made barriers (8) . … in the middle of a large search effort. 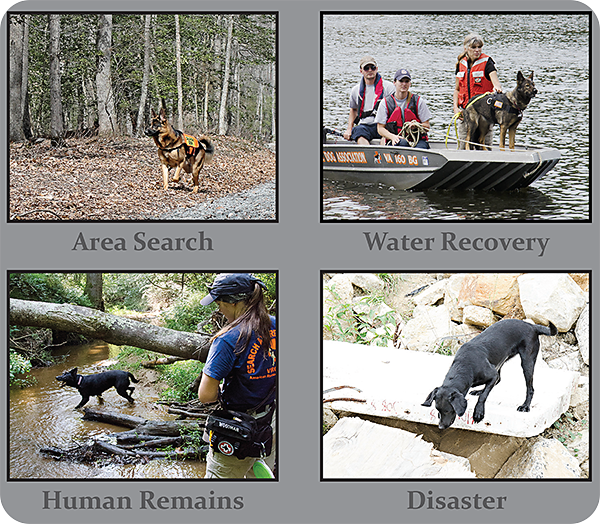 In the middle of a multi-day search, dog teams should be assigned to those search areas where they can be most effective, in comparison to and conjunction with other search resources. In typical Tasmanian bush, dog teams will be most effective checking large areas of open forest where the foliage is sufficient to impair the POD from a helicopter. They are also especially useful in areas where visibility of ground search teams is severely reduced by heavy foliage. Other priorities notwithstanding, ask the dog teams to check for scent along ridge lines, in mountain passes and where drainages come together. … after several days of searching. 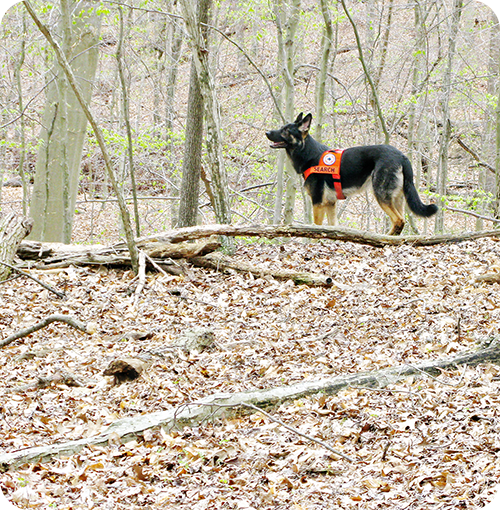 If several days of searching have not produced results, dog teams may be used to eliminate large search areas outside of the original search parameters, or to methodically recheck areas of high probability previously searched by human search teams, particularly if search conditions were less-than-ideal or if it is suspected the subject was moving. Search dogs can detect scent up for several days after the subject went missing, even if the person is deceased. Dog teams are capable of working unaccompanied, and may prefer to do so in the early stages of a search when resources are limited. While a dog is working, the handler will be focused almost exclusively on the dog, directing it and watching for “alert” behaviours. If the terrain is such that the boundaries of the search area are not obvious, and if resources permit, a navigator should be assigned to work with the dog team to ease the handler’s workload. The navigator should always keep downwind of the dog and slightly behind the handler. Each dog team will report back from a search task with an estimate of the POD for their work in the assigned area. Handlers will report any areas the dogs are unable to check (eg. impenetrable brush, deep swamps, cliffs). They will also report the location of any areas worthy of further investigation where the dog showed interest but did not make a find. POD will vary according to wind, convection, vegetation and terrain, as well as the width of passes. Handlers will adjust the width to suit conditions. Dogs and humans have different PODs, and the handler will usually cover visually only a portion of the area the dog searches (for example, around 30m of a 100m pass). In general, the combined POD of dog and handler will be up to 96% when passes are made 100m apart through moderate terrain. Dogs navigate through heavy brush better than humans and most working dogs will have almost unlimited stamina on trails and in light-to-moderate terrain. Dogs tire quickly in deep soft snow, but the stronger working breeds will keep working. For practical reasons, their use is limited around cliffs and in steep rocky country requiring climbing or frequent scrambling. Terrain and weather will affect how long dogs can work, but they will generally work in similar stretches to human search teams, with similar rests between. With adequate rest, well-trained and motivated (9) search dogs can be expected to work throughout multi-day searches. Air scenting dogs do not generally require a scent article to search effectively, but in some cases it can assist the dog to discriminate between the subject’s scent and others in the search area, and perhaps pick up the subject’s trail if crossed (10) . Search and rescue dog teams will generally each require a portable radio to communicate with the search manager and where possible should also be assigned a separate and dedicated channel so that handlers can converse and seek advice from each other without disrupting other search activities. SAR dogs will travel by almost any means that human searchers can use including vehicles, snowmobiles, boats, helicopters and light aircraft. Some dogs and handlers are trained to be lowered or extracted by winch from a helicopter. Handlers will rarely allow their dog to be transported separately. Dogs will remain with their handlers at night if not working, either in the field or in a hotel or b&b. Handlers will generally tent with their dogs rather than leave them with someone if the dog is not permitted at commercial accommodation. Dog handlers will generally bring a two day supply of dog food. Arrangements should be made to obtain suitable dry dog food if the search will extend beyond this time-frame. Dogs will happily drink from streams, lakes and puddles, but if the area is dry and no natural water sources are available, allow the same amount of water per day for a dog as for a human searcher. Handlers have invested literally hundreds of hours and thousands of dollars in training and equipping their dogs for search and rescue work; in the event of injury to the dog, every possible assistance to obtain veterinary assistance or evacuate the dog and handler will be much appreciated. ARDA: “Search and Rescue Dogs : Training the K-9 Hero”, American Rescue Dog Association; Wiley Publishing Inc., New York; 2nd Edition (2002). Hill, Kenneth A., Ph.D. “An Introduction to Ground Search Management for the Police Authority”, Halifax Regional Search and Rescue; Halifax, Nova Scotia (1994). Sherri Gallagher, President, 2004 ARDA-IL Chicago Regional Search and Rescue; Chuck Melvin, 2004 Team Leader, K-9 Search and Rescue Team, Dolores, Colorado; Neil Powell, 2004 Training Officer, SARDA Ireland North; Douglas James, 2004 Liaison Officer, SARDT, Launceston, Tasmania. Special thanks to Alice Stanley, Founder, Virginia Search and Rescue Dog Association, ARDA-Va., for her review of early drafts of the paper and her extensive comments. This paper is specific to air-scenting dogs. Some of the guidelines and techniques described will be different for tracking dogs and as such specific advice should be sought from qualified tracking dog handlers if these available in your jurisdiction. Many volunteer search and rescue dog teams will not undertake searches with potential for criminal activity that would place the dog or handler at risk. Some handlers report search dogs trained only with live subjects may not alert on deceased victims except where death is relatively recent (ie. within 24 hours). Many however report their dogs will find human (even skeletal) remains weeks and even months after the subject disappeared. Human scents vary, reflecting each person's gender, race, hygiene, diet, toiletries used and other factors, to a dog giving each a unique "signature". A SAR dog will identify and generally not search again for someone they have already found in that session. Depending on circumstances, a dog team may search the perimeter of a search area before conducting sweeps across it and into the wind, in the hope of picking up a scent. 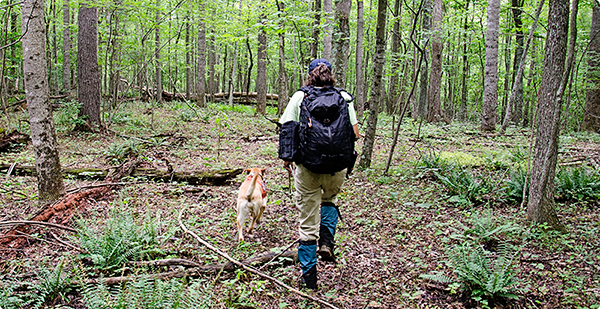 If a tracking dog is locally available, let that dog work while air-scenting search dogs and other searchers are responding. Even if the dog does not successfully complete the track (ie. does not find the victim), it may give subsequent searchers a direction of travel, significantly reducing the search area. The only caveat is that failure to find the victim does not guarantee the dog was working the correct track. Most tracking dogs will start work from the PLS. Research shows most lost persons will react in predictable and documented ways when facing physical barriers such as fast-flowing streams or drainages and man-made features such as trails, logging roads etc. Historically, at least 50% of lost children, hikers, walkaways and despondents are found within 2.5km of PLS. Hasty searches of trails and drainages by a dog team have the advantage of using the dog’s scenting capabilities to check large areas to either side of the trail or drainage, in the same time as a human search team would only be able to check the trail or drainage itself. To keep dogs motivated, in multi-day searches handlers may periodically request assistance from someone at base to “hide” nearby so that as the dog returns at the end of a search session it can be rewarded with a “find”. If a scent article is to be provided, it must be uncontaminated by others touching it or from being in contact with other’s dirty clothes (ie. not an item from communal family laundry basket). Preferably obtain an unwashed upper body inner garment (eg. undershirt, t-shirt etc.) worn and handled only by the subject. The article should be gathered into an unused sealable Ziploc bag without further human contact (by using tongs, a coat hanger or turning the bag inside out and then grabbing the article with it). The bag should be sealed, marked with subject’s name and the date and time collected, and presented unopened to the handler. Copyright 2004-2011 by David Godfrey-Smith. Used with Permission. All rights reserved.